Will Apple’s Anti-Algorithm Save Music? Beats 1 Radio is the most contrarian bet in the music world right now. And that’s exactly why it’s exciting. The progress in the music + tech space in recent years (if you can call it progress) has been dominated by an obsession with algorithms. The promise has been that algorithms, if properly developed and fed with data, would be able to offer infinite personalization that would make bigger music fans of us all. But it hasn’t really worked out that way. Despite the best efforts of the bots, having an infinite supply of music at our fingertips has made our music listening more provincial… not less. Our biological hard wiring to favor the familiar leaves us with little immediate affection for anonymous recommendations, and the vast majority of music listeners have little appetite to put in the effort associated with finding new music. To this challenge, most technologists reply by saying that the algorithms just need more: more data inputs, more technological honing, more time. Apple seems to believe that we’ve been approaching this thing wrong all along. And so, with Beats 1, the biggest technology company on the planet has introduced the ultimate anti-algorithm. And I think this radically contrarian bet is one of the biggest reasons to be excited about music’s future. I find Beats 1 so exciting for three reasons. One of the most surprising aspects of Beats 1 is how incredibly and endearingly unpolished it is. The unscripted spontaneity of nearly every show gives the station the handcrafted vibe of a late night on college radio. There are genuine jokes and honest technical mistakes, songs stopped mid-stream and interviews where truly nobody knows what’s going to be said next. But here’s the rub: the DJs on this ramshackle college radio broadcast are a collection of the biggest stars in the music world. Beats 1 features everyone from Eminem to Elton John to Dr. Dre and Drake… and that’s just in the first week. But when these superstars leave their PR people behind and open up through music, the result is the most honest into these individuals that I’ve ever heard. It’s addictive, irresistibly shareable stuff, and has led some to look at Beats 1 as the future of Twitter. Much has been made of the fact that Beats 1 broadcasts live to 100 countries simultaneously (well, at least when it’s not on replay). But, while conceptually interesting, the fact that Beats 1 is broadcasting to 99 other countries doesn’t in and of itself have much value to your average listener. But what makes the global nature of Beats 1 interesting is the degree to which the DJs are repping their cities: Ebro does a show that is of NYC, not just from it. And when Julie Adenuga says “this is London,” she actually delivers on it. While this local aspect is just a glimmer right now, it holds promise for a truly exciting vision of what it could mean to be a global radio station. Benedict Evans has said that Apple Music reminds him of Google Maps as it provides “manual curation at scale.” With Beats 1, we can take the analogy of Google Maps one step further, as it holds the promise of allowing anyone, anywhere to peek into another part of the globe and appreciate it in a new way. Powerful stuff. The fatal flaw made by so many in the music streaming space is that they massively over-estimate the amount of effort your average listener is interested in expending. They create services for their 25 year-old music nerd selves, and lose track of the fact that the continued dominance of FM radio and the enormously broad appeal of Pandora is rooted in the incomparable ease of these two services (oh, and they’re free). Beats 1 not only eliminates complication, it prevents it. The only things you can do with it are turn it on and turn it off. But the hyperactive curation built into the broadcasts makes Beats 1 feel like a very active experience though it requires absolutely nothing from the user. It’s as effortless as FM radio, yet often as exciting as a mixtape discovery. 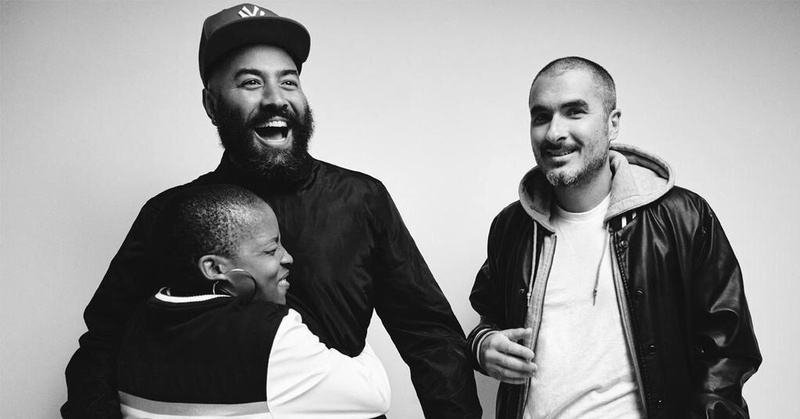 These three reasons makes Beats 1 an incredibly massive experiment in what radio and digital music can be. About a year and half ago, I wrote that “Radio has to radically re-think what it needs to be.” At that time, it was more of a lament than an actual statement of hope. But now, with Beats 1, Apple has given us reason to think that good old fashioned radio might help pave the way into the future of music. It has been a very quiet few months here at the blog. Part of this has been due to the natural ebbs and flows of work/life busy-ness that has led to prior lapses of authorship. But another part of this absence is that I have been writing; I’ve just been doing it elsewhere. Many of you know that I have been doing more and more writing and speaking over the past year or so, giving talks to various companies and classrooms who have been kind enough to invite me. The discipline instilled by these speeches (i.e., I’m getting on stage and need to have something to say) has spurred me to distill and refine a lot of my thoughts on how the future of marketing innovation can be inspired by the re-invention of the music industry. Since many of the ideas in these speeches started as posts on this blog, I thought it was a good time to re-unite these two worlds. Here are the slides for a speech that I’m giving this Friday at the Kellogg School of Management. Though you won’t be able to view the videos and whatnot, you’ll still get a sense of things. I hope you enjoy it. As I’ll still be fine tuning things for the next few days, shoot me a note with any thoughts you might have. And more to come soon on the pages of this blog. Stay tuned. In our on demand world, so little truly surprises us. Every iota of new music is previewed, leaked, retracted, seeded, announced, featured, live streamed, and retweeted with a predictable cadence that numbs the effect of the publicity it’s meant to ignite. But, because it has become so scarce, this elusive surprise that is the most powerful publicity tool in our hyper-social world. Until a year or two ago, suggesting that a superstar drop their entirely-unnancounced album in the middle of the night would ensure your swift departure from the music industry. But now, such surprise breaks the internet and sales records alike. In the first three hours of its sudden availability (the hours of 12am-3am, not traditionally associated with peak sales), Beyonce had sold 80,000 albums. 12 hours into the album’s existence, it had generated 1.2 million tweets– 5,300 tweets per minute at the height of its fervor. 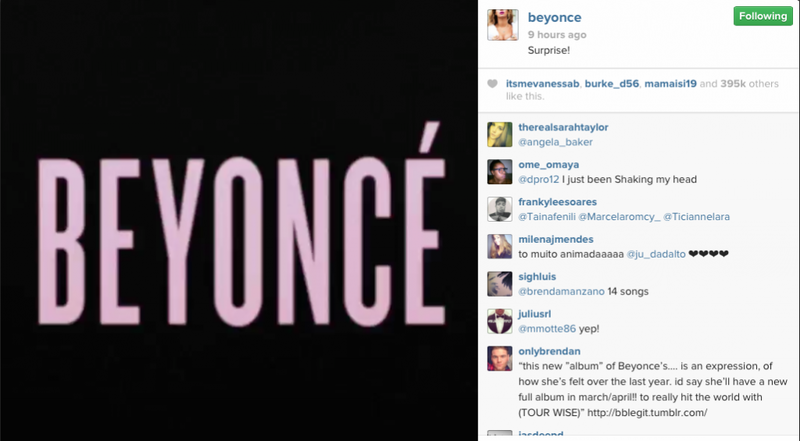 In their attempt not to be forgotten, Facebook said that mentions of Beyonce spiked more than 1,300% in the hours after the album dropped. So as not to dampen the early days of its allure, I’m not going to post any tracks from the Beyonce album. Instead, I’ll once again share a track that I’ve been brought back to as it makes a well-earned appearance on most “best of” lists for the year. I never would have guessed that a haunting, six minute, semi-hippie track would have lingered amongst my favorites for so long. As both Beyonce and Phosphorescent demonstrate, sometimes what you remember most is what you least expected. 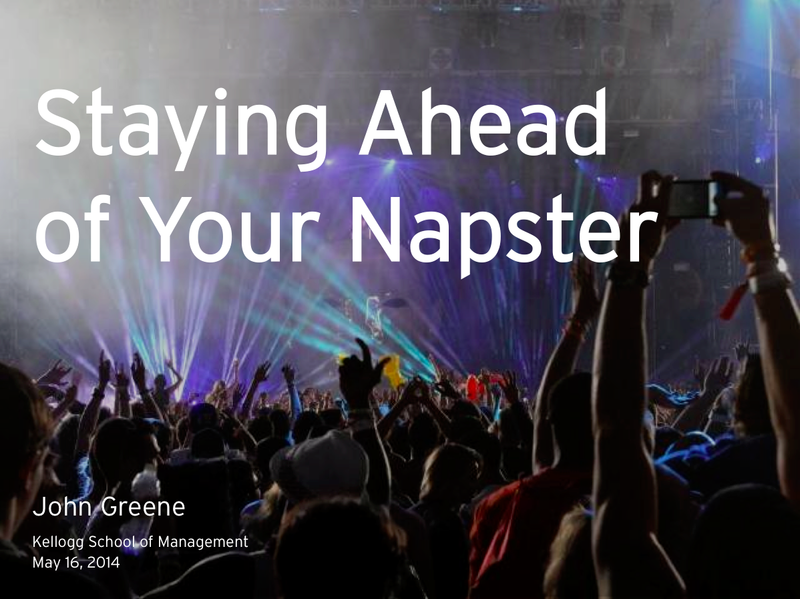 For me, Napster was never about the music being free. It was all about the music never having to be purchased. For music fans such as myself, the process of walking up to a music store register (when such still things still existed) was not just a transaction– it was a declaration. Here I am, here are my purchases, here is who I am. But there was a significant hitch to this approach to life. There were times (and we’ll keep the number of such instances as a secret amongst us) when you wanted to buy an album that you didn’t want to declare. That little pop hit that tapped into the car-singer in you. That bit of folk that tapped into the college student in you. That guilty pleasure that you were tempted to slip in between two other more reputable purchases as you snuck up to the register when nobody else was there. Though these songs called out to you, there was no way to bring yourself to reach out to them. 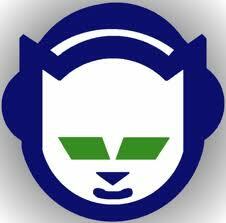 At the moment when Napster arrived, you didn’t really have a problem paying for music. There actually wasn’t some pent-up pounding that you were waiting to wreak upon record labels (maybe Ticketmaster, but not really the labels). What you did have was a pent-up itch for records that you didn’t have a problem paying for if only you could just find a way to buy them without shame. But then Napster appeared and, well, Def Leppard tracks soon followed. And shortly after that came experiments that you wanted to make but would never leap to in public. And once that the music industry allowed you to realize that you really could sample music for free (and in private), soon you were able to come to the conclusion that all songs were little more than ads for other revenue sources (that the record labels needed to identify), the levee broke. So, thinking back, the beauty of Napster was that you were able to freely and secretly see what would come from the next incarnation of Edward Sharpe and the Magnetic Zeros… even though you’d prefer not to answer to why you wanted to do so. Even though Napster is now relegated to a glancing reference to movies about Facebook, I will afford this private indulgence: without having to tell anyone (least of all a judgmental cashier), you can discover that the new Edward Sharpe song does indeed involve what sounds like a gourd half-way through. But let’s keep it between us… no need to declare.